Contour Threads is an exciting new procedure that offers a simple and minimally invasive option to the traditional facelift. Using FDA-approved Contour Threads, the Thread Lift can reposition sagging cheeks, jowls, neck or eyebrows, or adjust asymmetric brows. A procedure with the patented Contour Threads is safe, conservative, and effective to offer subtle, natural-looking results. The Contour Threads Facelift can address moderate drooping of the soft tissues of the brow, face and neck. The Contour Threads may also be used to improve poorly defined upper face , lower face, midface and neck contours. In general, the best candidates are in their 30s through 60s with good skin condition. The specially designed clear sutures have tiny barbs or cogs that are spaced evenly apart. Once inserted under the skin, they are fixated in an umbrella like fashion. The tension on the cogs creates suspension that gently lifts sagging tissues of the brow, face and neck. Once in position, your body generates new collagen bundles that surround each thread to maintain the lifting effect. The placement of sutures and number required will vary from patient to patient. The advantages to this procedure is there are no visible scars and the recovery time is minimal. Contour Threads are performed under local anesthesia and the actual length of time will depend on the number of threads used and the extent of the area treated. A typical procedure takes 45 to 60 minutes to perform. In most cases, there is minimal discomfort, bruising, and swelling. Ice compresses are recommended for the first 48 hours. Patients can usually return to normal activities in a few days to one week. The length of time the results last depends on the age of the patient, the degree of sagging, and the number of threads used. Additional threads may be added as needed. The Contour Threads facelift allows for a traditional facelift, browlift, or neck procedure. This new procedure sounds great but how long will it last and can you have them taken out? Pamela, the thread lift procedure is a great option many men and women with minimal recovery time. The surgeons who perform this procedure say it will last anywhere between 10 to 15 years but obviously will differ for every person. 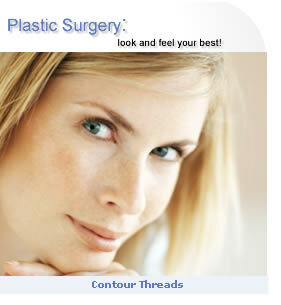 You can have the thread lift removed at anytime which makes this procedure ideal for many people. I am interested in getting a thread lift. Could you tell me about possible thread lift side effects? Thread lift side effects Matti, The side effects of a thread lift procedure are generally mild such as swelling, bruising and minor pain. These usually subside within three days. Hello SSI, I am really interested in getting some plastic surgery, definitely a nosejob but I want something more, but it's kind of hard to find a general cost for plastic surgery, can you give me some prices? Hello Richard, I know it is really hard to find the general cost of plastic surgery, I worked on it for months that is why if you go to compare prices on the SSI website you will find not only the average cost of plastic surgery in the United States but also our prices. You can also find cost information on the Package page which lists the prices for multiple procedures. If you can't find what your looking for go to get a quote and let me know!